In exquisite prose, Hoffman offers a transforming glimpse of small-town America, presenting more than three hundred years of passion, dark secrets, loyalty, and redemption in a web of tales where characters' lives are intertwined by fate and by their own actions. The Red Garden introduces us to the luminous and haunting world of Blackwell, Massachusetts, capturing the unexpected turns in its history and in our own lives. From the town's founder, a brave young woman from England who has no fear of blizzards or bears, to the young man who runs away to New York City with only his dog for company, the characters in The Red Garden are extraordinary and vivid: a young wounded Civil War soldier who is saved by a passionate neighbor, a woman who meets a fiercely human historical character, a poet who falls in love with a blind man, a mysterious traveler who comes to town in the year when summer never arrives. At the center of everyone’s life is a mysterious garden where only red plants can grow, and where the truth can be found by those who dare to look. Beautifully crafted and shimmering with magic, The Red Garden is as unforgettable as it is moving. Alice Hoffman is the author of more than thirty bestselling works of fiction, including Practical Magic, a major motion picture; Here on Earth, an Oprah Book Club selection; the highly praised historical novel The Dovekeepers; and, most recently, The Museum of Extraordinary Things. Her books for teens include Green Angel, Green Witch, Incantation, The Fortelling, and Aquamarine, also a major motion picture, starring Emma Roberts. Visit her online at alicehoffman.com. "Hoffman’s writing is so beautiful it’s almost painful to read... Hoffman makes the magic she writes about feel so real, as though I could at any moment, find myself in the town of Blackwell and the mysterious garden that bears only red fruit." "Alice Hoffman, herself a shining star among American novelists, possesses the stunning ability to express the numinous in the most prosaic language. Somehow, without elaborate wordplay, she manages to communicate a yearning interpretation of the life we all live, opening the reader’s eyes to the otherworldly riddles that make things appear just a trifle askew—when we notice them, that is. And Alice Hoffman certainly notices them. One secret of her ongoing appeal, year after year, book after book, is her keen perception. 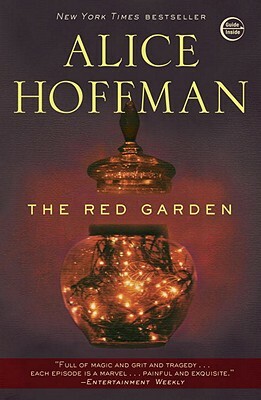 And in The Red Garden, Hoffman delivers a body of stories that explores the depths of reality as well as its enduring quirkiness." "In gloriously sensuous, suspenseful, mystical, tragic, and redemptive episodes, Hoffman subtly alters her language, from an almost biblical voice to increasingly nuanced and intricate prose reflecting the burgeoning social and psychological complexities her passionate and searching characters face in an ever-changing world." "Hoffman has done it again, crafting a poignant, compelling collection of fairy tales suffused with pathos and brightened by flashes of magic. Her fans, as well as those of magical realism in general, will be enchanted." "Fans of Hoffman’s brand of mystical whimsy will find this paean to New England one of her most satisfying." "The novel moves forward in linked stories, each building on (but not following from) the previous and focusing on a wide range of chracters....The result is a certain ethereal detachment as Hoffman’s deft magical realism ties one woman’s story to the next even when they themselves are not aware of the connection. The prose is beautiful, the characters drawn sparsely but with great compassion."